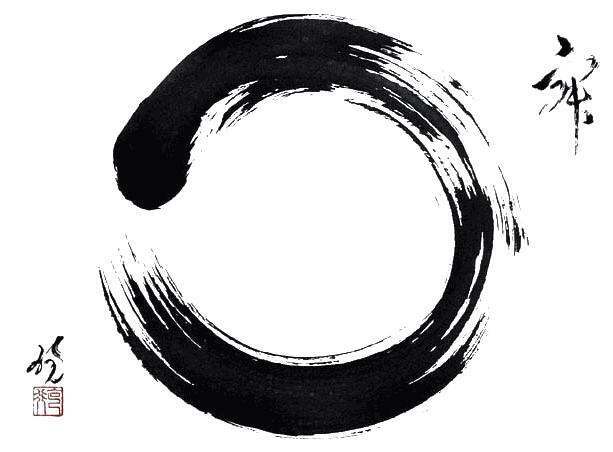 Zen Brushwork combines full body movement with mark making, offering insight and increased mindfulness. These one day workshops draw from the Zen tradition of calligraphy. Using energy raising exercises (yokiho) and sitting (zazen) the focus throughout is to relax body/mind and allow ki ( energy) to flow freely as we draw, using a large brush. It would also be helpful if you could bring a cushion for sitting and to wear clothing that allows freedom of movement (please note that the ink can stain). Jos Hadfield learned from Terayama Tanchū Sensei, both in the UK and in Japan. She has been practising Zen Brushwork for more than ten years, and enjoys every opportunity to continue learning, and sharing, this meditative art form, which she likens to re-presenting the relationship between the mind, body and universe. Jos also teaches t’ai chi, seeing these art forms as explorations in the relationship between mind, body and the universe. An early interest in textiles led to a Fine Art Degree at Winchester Art School, and a further means of working with form to express our response to space.